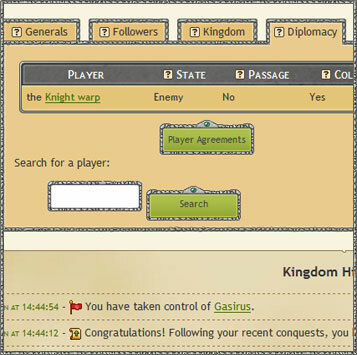 Diplomatic agreements between players can be modified using the various settings listed in the Diplomacy section of your Home page. Right of Passage : You authorise this player's generals to move freely throughout your kingdom. Access To Resources : You authorise this player to collect rare resources in your kingdom, on the condition that his capital is connected to the location where he wishes to collect resources. Friend or Enemy : You can declare a player an enemy or a friend. being an enemy means that your generals will automatically attack anything belonging to the enemy immediately upon arrival. Strategic Mode : it is possible to display the kingdom of each player by clicking on the map. These maps do not differentiate between a player's own kingdom and those of his followers, but it does allow you to see exactly where they are and to have a good idea of how powerful they are.